WELL-VERSED: Nov. 26, St. Andrew. As the curtains came down on the 14th Annual Poetry Awards put on by the Red Bones Blues Cafe, judge Carolyn Cooper hit centrestage to present second-place finisher Everard 'Esquire' Smith with one of his two awards for the night. In addition to the runner-up spot, Smith also copped Poem of the Year for his stirring performance piece "Time." CHOOSING WISELY: Nov. 26, St. Andrew. Moments before the awards segment, judges Cooper, Prof. Mervyn Morris and Mel Cooke huddled at the head table as they tallied their final scores. FANTASTIC FOUR: Nov. 28, Kingston. On the occasion of starring in Fabian Barracks' riveting teen drama Bad Apple at the Theatre Place, the play's four-member ensemble cast (from left, Shantol Jackson, Nicholas Amore, Jodian Findley and Shauneca Woollery) assembled, post-performance, to rap with the young audience members and pose for photos. ROOM FOR ONE MORE: Nov. 28, Kingston. Theatre-arts students from Manchester's Holmwood Technical also rounded up the cast for posterity photos after Friday's performance of the hit play at the Theatre Place. REAL TALK: Nov. 22, Kingston. It's been a banner season for plays from theatre's emerging voices. Sherine Bailey's laugh-out-loud production The Real Show played to mixed reviews at the same venue a week ago, featuring a cast of seven. THE MARRYING KIND: "It's a miracle we're still together," the author jokes of life with hubby Martin, also a writer. In the second part of our exclusive interview with Pamela Mordecai, at the Bookland, New Kingston launch of her latest poetry collection, Subversive Sonnets, the celebrated author riffs on the appeal of the Jamaican creole, life in Canada, and the success of her first stage play, El Numero Uno. 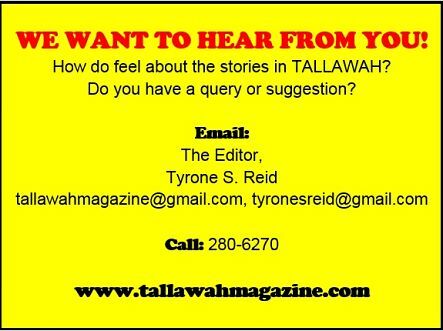 TALLAWAH: You've published children's books, story collections, poetry anthologies and educational texts. And now your first novel is due out next year. But that's not all. Your first play, El Numero Uno, got its premiere in Canada earlier this year. What did you make of the response it received? Pamela Mordecai: It was very well-received, perhaps best by the Caribbean community. I enjoyed working on it. It was in development for a long time. I worked with dramaturge, who is someone who helps playwrights develop their plays. I enjoyed the process very much. We used many languages and quite a few songs. TALLAWAH: You recently had a medical procedure at the University Hospital. How did that go? P.M.: It was amazing (Laughs). I had an endoscopy, where they insert a camera down your throat to look around. I was asleep the whole time, but I heard it went well. TALLAWAH: You made a point in your presentation earlier about the complexity and uniqueness of the Jamaican dialect, which struck a chord. P.M.: I don't think our Jamaican creole is given the respect it deserves. It is a very expressive language, very complex and inventive. We're always coming up with new ways of saying things, and the foreigners love it. I think the Jamaican language ought to be cherished. TALLAWAH: Is that why you chose to title one of your upcoming works Di Book of Mary? P.M.: Precisely. That book will be about Jesus' mother, her life from a fresh perspective. It's the second in a series. The first one I did was called Di Man, which was about the life of Jesus and the opening line was "Yuh see mi dying trial!" I'm planning another book in the series, which I will call Di Book of Joseph. So the series will have three books in total. TALLAWAH: What's the best thing about living in Canada these days? P.M.: I get to go to prayer meeting once per week (Laughs). One of the good things about Canada is that they give money to the arts. A lot of writers do well in Canada because the government sets up programmes that fund the arts. PART 1: Mordecai gets candid about writing for young readers and readying her first novel, Red Jacket. DREAM STATE: Apple (Jackson, right), enjoys her reverie as BFF Poochie (Woollery) looks on; the teacher plots his move. With Bad Apple, fast-rising playwright-producer Fabian Barracks immerses us in a world populated by angst-ridden schoolgirls, their sometimes unattentive guardians and the sexual predators always lurking in the shadows. The play's central idea of young girls being robbed of their innocence by powerful men who are supposed to be protecting them is not exactly a novel concept, but here it's given a honest, unflinching interpretation that hits very close to home. Compelling, twisty and very well-acted, Bad Apple might be primarily aimed at the teen crowd but its sobering message and adult situations speak to people across the board. We are introduced to shy, sweet, Shakespeare-quoting Appleonia Smith (Shantol Jackson), a fifteen-year-old whose fantasy is to be swept off her feet by a knight in shining armour. "Someday My Prince Will Come" could be her theme song. In stark contrast to her "bookophobic" spitfire of a best friend Poochie (Shauneca Woollery), Apple is focused on excelling academically in the hope of rescuing her struggling, no-nonsense Auntie Vinette (Jodian Findley) from a life of domestic servitude. Things are going swimmingly well for the pretty young miss (bright and ambitious if a bit naive) until love gets in the way. Blinded by his slippery charms and the thought of her Romeo & Juliet moment finally coming to life, Apple becomes romantically entangled with her literature teacher Brian Gayle (Nicholas Amore), a smooth-talking married man who worms his way into her heart and her bed. But what was supposed to sweep her off her feet ends up smacking Apple upside the head and flipping her world upside down — complete with emotional blackmail, humiliation and death threats. We feel for Apple and not just because the narrative arc of her story is so recognizable and steeped in reality. As portrayed by Jackson (a talented rising star possessed of a very natural style), she becomes a haunting symbol of shattered dreams. Even so, the resolution of her ordeal never lets us forget that the darkest hour is just before the light. ON THE RACKS: The wardrobe mistress strikes a pose among some of her designs at LTM headquarters. For Anya Gloudon-Nelson, the most rewarding part of producing the costumes for the annual LTM pantomime comes during showtime when the occasional audience member elicits a Wooh! as one of her designs steals the spotlight. Or when a camera-phone stealthily emerges to snap a quick pic of a particular look. According to the veteran seamstress, now 41, nothing quite compares to the final product being appreciated. But Anya will be the first to tell you that the creative process of getting to to that exhilarating high demands challenging, painstaking work. On a cool Tuesday afternoon at the Kingston-based LTM headquarters (situated on the Little Theatre complex), Gloudon-Nelson is giving TALLAWAH a grand tour of the facilities - the sewing room, the jam-packed storage areas, the props cabinets etc. — where season after season, working with a team of three, she makes the magic happen. "Evey year has its challenges, and right now I feel like I'm late," she admits with a laugh. "This kind of work takes up a whole lot of your life because we start around September and we take them through the workshops straight up to the opening. And the pantomime runs up to May, and then we have the summer show to do. So you're constantly in work mode." Even so, getting to collaborate on the annual productions has become one of the most meaningful aspects of her life. "The good thing is I'm doing what I love," she readily concedes. As she explains, the recognition from her industry peers is always welcome but it's never about the physical accolades. What she prizes above all else are the experience, the Company camaraderie and the fun aspects of the job. Then there's the relationship with her mom that continues to deepen in amazing ways. "One of the best things about working with Mrs. G is learning that you are never truly finished; you can always do better, adjustments can always be made," she reflects, noting that they share artistic feedback and have their (hysterically funny) quarrels every now and again like all mother-daughter pairs. While on the subject of family, I ask is she's at all bothered by the talk that she got the costume design gig primarily on account of being Barbara Gloudon's daughter. "They might say that, but I am not bothered by it. What makes me happy is when people come up to me and express how pleased they are with the work. The quality of my work will always speak for itself," she says. According to Anya, she's more than earned her place in the LTM fold. "As a member of the team I will go the extra mile," she insists. "If money is tight I know how to work around that. I consider myself an asset to the LTM." Anya Gloudon-Nelson is showing me some of her design ideas for the 2014/15 pantomime, Princess Boonoonoonoos. As she displays the rough pencil sketches on white paper, she recalls with a laugh how her team members are constantly teasing her that her hand-drawn characters are always faceless. "It's not about the faces; it's about the clothes," she counters in her own defence. This year's pantomime features a cast of over 20 performers and each has at least three costume changes to make. So you're looking at over 100 pieces for this year's show, in addition to accessories and the occasional pieces of embellishment. As in years past, Anya has her work cut out for her. Thankfully, her highly reliable and productive team go a long way in making the burden bearable. Mavis Williams has been a behind-the-scenes fixture at the LTM since the 1980s, Opal Miller has contributed to some 20-odd productions over the years, and Ewan 'Brains' Harvey is the resident tailor, who regularly pulls double duty as the chef. "We work very well together as a team," Anya conceded. "They are some of the greatest people in the world because sometimes there are things you ask them to do, out of the ordinary, and they don't hesitate. So I am extremely grateful to have them to work with." Anya Gloudon-Nelson is not a fashion designer; she's a "watcher." "I will walk along Orange Street and watch how people are dressed, how the women mix styles and patterns, and things that I pick up on will eventually inspire me in my creative process," she explains of her research technique. "I watch body language, the lengths of the skirts, and I apply it to the designing. For me, it's more about character than fashion, as applied to the process of design." And variety is key, whether she's crafting clothes for peasant or prince. Audiences will get to see her take on both worlds when Princess Boonoonoonoos commences previews on December 26, in what promises to be a rollicking and uniquely Jamaican musical comedy about country living versus the royal uptown treatment. With opening night less than a month away, it's crunch time at the LTM, and rehearsals are well underway. At her age, Anya is used to the pressure of having to deliver and raise the bar each time. As one can imagine, she's gleaned countless life lessons over the years. As if reading my mind, she discloses that the greatest lesson she's learned on the job has to do with outfitting actors cast in the roles of politicians. "Be careful of the colours you choose," she tells me. "Whenever I'm designing a costume for a Jamaican politician, it's either in blue or peach." WINNERS' CIRCLE: Prize winners Smith, Burke and Alexander after the show. Seven emerging and distinctly Jamaican poets rocked the mic at the Redbones Blues Cafe's 14th annual Poetry Awards on Wednesday night, all vying to win over the sizeable crowd and estimable judges Poet Laureate Mervyn Morris, Professor Carolyn Cooper and journalist Mel Cooke. In the end, seasoned wordsmith Nicholas Alexander, a 38-year-old educator whose work has been featured in The Caribbean Writer and other notable publications, came out on top, with second place going to Everard 'Esquire' Smith and third-place honours falling to triple-threat mixed-media artist, painter and poetess Nancy 'Inansi' Burke. They were each presented with attractive small prizes. Whether capturing hope, humanity or the socio-economic status quo through keenly observant lyrics and tasteful verse, the performers kept the crowd engaged with stirring, controversial, lively presentations often buoyed by self-assured delivery. A fun-loving type with commanding stage presence, Smith was particularly outstanding, so it didn't come as a surprise that he took home the coveted Poem of the Year award, for his humorous, rapid-fire piece "Time," which met with thunderous applause. Who are these poets? According to event conceptualizer and Red Bones proprietor Evan Williams, himself an ardent devotee of the written and spoken word, the bunch primarily consists of artists who, over the course of the past ten months, had been invited to recite at various Redbones events. Brought together now to face-off in a kind of poetry slam, the septet was judged on a criteria spanning content and originality, performance style and overall presentation. As Williams went on to explain, the Poetry Awards was conceived over a decade ago, emerging out of his love for verse. It has since bloomed into something the Redbones family avidly anticipates each year, as it brings a flavourful, lyric cafe vibe to the place known for its easy-breezy ambience. While Williams didn't go into details regarding the event's next chapter or its impact, he's content that the awards add something meaningful to Kingston's arts scene and boasts an esteemed alumni that includes the Forward Prize-winning Kei Miller, the inaugural first-place winner. "The awards have certainly become a staple on our yearly calendar," Williams says. "It is still a very young event, so we expect it to grow into something bigger as time goes on." LIFE FORCE: Shoshanna Weinberger's "Collection of Strangefruit," from the 2012 exhibition. When the Jamaica Biennial blockbuster art exhibition has its grand opening in December, the National Gallery of Jamaica won't be the only venue hosting the displays and the large crowds. Instead, a total of three venues, spread across the island, are doing the honours this year — the Downtown Kingston-based gallery, of course, the uptown landmark Devon House and the new-kid-on-the-block National Gallery West, located inside the Montego Bay Civic Centre, smack in the heart of Sam Sharp Square. For us, the exhibition's move uptown and into the West is a clear indication of the gallery's commitment to breaking new ground and spreading the dynamic energy while maintaining aspects of the established framework in support of the best that local art production has to offer. TALLAWAH dropped in on the crew at the National Gallery on Wednesday afternoon, and while we didn't score any exclusive deets on the highly anticipated show, we were more than pleased to see that preparations have slipped into high gear. Arguably one of the biggest art-based events in the English-speaking Caribbean, the Biennial brings together a host of outstanding Jamaican artists, based at home and abroad, whose exemplary craftmanship and fascinating ways of seeing never fail to astonish and inspire. In fact, December's bounty is so chock-full of highlights that the show is being split into three distinct sections representing the broad spectrum of Jamaican art, as well as important works from the region, the Diaspora and relevant talents from the wider art world. "Legacies" will display work by senior Jamaican artists and by those (whether juried or invited) who tend to work in more traditional methods. "New Ground" will be an exhibition of contemporary Jamaican art from both established and emerging voices. Most interesting, "Special Projects" will feature a series of smaller self-contained exhibits by specially invited regional and international artists, as well as from the calls for proposals for the National Gallery West. All participating artists, invited or juried, are eligible to win the prestigious Aaron Matalon Award (Laura Facey Cooper is a past recipient) — a monetary prize that also comes with a uniquely designed medal. The Jamaica Biennial 2014 will open to the public on December 7. The opening reception is slated for December 14. ESPRIT DE CORPS: Performers take centrestage during Sunday's season-closer at the Little Theatre. These are dancers barely in their 20s - some of them just learning about craft and technique - but the maturity and artistry they bring to the stage is nothing short of awe-inspiring. Star pupils indeed. I'm referring to the corps of the 26-year-old Company Dance Theatre, which delivered its spellbinding 2014 season — a feast of avant-garde choreography and passion play — at the Little Theatre in Kingston on the weekend. Almost as triumphant as last year's production, which reintroduced audiences to the Rose Hall saga, Season 26 didn't skimp on the kinetic energy, hyper-vivid costuming, stunning imagery and youthful verve that have come to represent the iconic Tony Wilson brand. It was a hugely enjoyable two-hour performance — a winning melange of new works and old favourites. Artistic Director Wilson proved he's still very much in his creative prime, unleashing the seductive, enchanting "Twilight," a 2014 debut featuring hedonistic couples moving in sync while clad in eye-popping red outfits. "Rebirth," his masterful opus from 2004, had earlier opened the show with a burst of whimsy and dancers keeping pace with Jon Williams' hypnotic score. As for the kaleidoscopic "Panorama" (2012) — a flurry of colour and Afro-Caribbean flair — brought the electric finale we'd anticipated. Those who came for rousing interpretations of innovative modern dance were not disappointed, as the contributions of two supremely talented young female choreographers-on-the-rise put everyone on notice. First up, the forward-thinking Liane Williams, whose edgy, techno-driven "The Freeborn) called for slightly robotic movements as it examined the radical shifts in human interaction and our never-ending quest for purpose and meaning. Ballet mistress Renee McDonald, meantime, was a bit more daring in her approach, offering the darkly compelling and stunning realized "Divulgence," featuring black-clad members of the company's female corps panting, sprinting, screaming and flitting across the stage in frantic sequences as Ludovico Eunadi's menacing score pumped in the background. To say the emotional work left dancers and audience members out of breath would be a gross understatement. And that's probably an apt description for the Company's 2014 season on a whole - a fantastic showcase of breathtaking works and new-generation talents giving us a glimpse at the possibilities of what the future can hold. HEAD TABLE: Mordecai (centre) reading selections at Bookland, alongside Dr. Earl McKenzie and Jean Small. Pamela Mordecai may be regarded across the globe as the legendary author of some of the most wistful stories for kids, informative classroom texts and evocative poetry that dually enlighten and mesmerize, but her writing reveals yet another dimension in Subversive Sonnets, her newest collection of poems which, as the book's title suggests, daringly toys with convention and goes against the grain in exploring everything from relationship dynamics and slavery to domestic strife and other big universal themes. "I admire what she does with language; how she uses the vernacular and slips effortlessly from one register to another," observes poetess Millicent Graham in an interview with TALLAWAH. "She writes about everyday things, but the perspective she brings to it is just so illuminating." Subversive Sonnets is indeed revelatory and finds Mordecai in candid, no-holds-barred form. Originally released in 2012, Sonnets got its Jamaican launch on Saturday afternoon inside New Kingston's Bookland, where Dr. Earl McKenzie and Jean Small read selections from the collection, and the likes of Prof. Eddie Baugh and Dr. Velma Pollard sat in the audience, which swelled as the event progressed. Raised by Catholic nuns in Kingston, where she attended Alpha Academy before heading off to North America's Newton College, Mordecai now divides her time between Jamaican and her adopted Canada, where she is as celebrated as that other Jamaican literary queen Lorna Goodison. But where Goodison has spent the greater part of her illustrious writing life chronicling our evolving history through poetry and short stories, Mordecai's forte has always lain in children's literature. To wit, her next anthology — Roots, Rhythms and Rhymes — is a collection of some 100 poems for children. The manuscript is complete, she tells TALLAWAH, and she's presently seeking a publisher. Explaining her approach to writing for younger readers, she notes, "There has to be a balance. I will write serious poems and stories for children, but I'm going to write funny ones as well. Literature is supposed to help us with life; to understand it better and to remember that for everything there is a season." For all her accomplishments in the fields of academics, West Indian lit, and education (she's taught at Camperdown High and the Mico College), Mordecai is still experiencing career firsts — on the cusp of age 73. Red Jacket (Thomas Allen Publishers), her very first novel, comes out next February. Set on the fictitious Caribbean isle of St. Criss, the story nods to Toni Morrison's The Bluest Eye regarding how race, class and colour continue to influence human relationships everywhere — and a little girl's enduring struggle to love herself. "In Jamaica, shade is such a touchy subject. People are really conscious of that," Mordecai says. "But it's something that needs to be discussed. I started working on this book around 2001, and I'm hoping it will contribute something very meaningful to the conversation." SHOW AND TELL: McDonald, holding a young 'fan', with Dr. L'Antoinette Stines following Sunday's recital at the Little Theatre. In person, the first thing that strikes you about dancer-choreographer Renée McDonald is her voice. Piercing and distinctive, it reels you into conversation with her, as her limpid does eyes widen with glee and hold you in place. When she expresses herself, you are in in awe of her refined tones, as if she were reared on lambs and literature, her words often peppered with witty repartee and accompanied by a river-wide smile. Such vitality, intellect and youthful vim also defines her creative expression as a choreographer with the Company Dance Theatre, and nowhere was this clearer than during Sunday's closing night of the troupe's 2014 season at the Little Theatre. McDonald offered "Divulgence," a fast-paced, moody and downright gripping examination of young womanhood and mortality that left audience members breathless. The vociferous applause that greeted the piece, which closed the first half, was the icing on the cake for McDonald, and the kind of encouragement that can keep a young creative genius' spirits lifted. "Working on this piece was very special for me, because it explores the personal choices each girl has to make, and that is something that I've never explored before. So it was very different for me. Very intense at times," reflects the 25-year-old budding choreographer. At intervals during our post-show interview, kudos arrived from admirers like the NDTC's Marisa Benain and Dr. L'Antoinette Stines, who quipped "Choreographers are born," while giving Renée a job-well-done pat on the back. All her life Renée McDonald has had an intense affair with the performing arts, the dance world in particular, but when it came to choosing her future career path, the legal profession won out. A Campion College alumna, Renee is presently in her second year at UWI's law school with about three more to go. And before law school, she completed a first degree in marketing. Is it hard balancing the books with her commitments as ballet mistress of a prominent Jamaican dance company? "It's extremely difficult," she admits laughing. "I've definitely had to improve on my time management but now that the season is over, it's books, books, books." McDonald, who plans to practise entertainment and intellectual property law, described being in a dance troupe as diverse and demanding as the Tony Wilson-led company as living with a cool little family in which she can still maintain her her identity as a fiercely talented individual. "The company is my home, really. It allows me to represent Mr. Wilson's style, while still being myself," she says. "Everything I do comes from a passionate place, so I try at all times to just be myself." SCENE CHANGES: Allen (centre) getting into character; Mignott and Donaldson as a conflicted father-son duo. Domestic dysfunction, gang violence, homophobia and a wallop of family drama. You get all that and more while taking in The Real Show, a moderately amusing, searingly realistic dramedy revue (from the new theatrical outfit Itarbaby) about daring to be different and the hefty emotional (sometimes physical) toll that can incur. 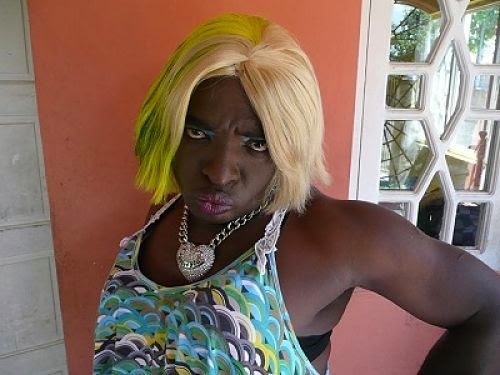 The show's central character Twist (the very funny Alwyn Allen), a poster boy for the flambuoyant gay Jamaican male, is a riot who makes no bones about flaunting his true colours and multiple personalities (including the fiery-tongued Miss Likkle), which can land him in all kinds of scrapes and sticky situations. Luckily, he has his cunning and his wits about him and, more of than not, emerges victorious. As for the remainder of the cast, promising writer-showrunner Sherine Bailey (a veteran with the Ashe Performing Arts Company) valiantly kicks convention and gender stereotypes to the curb, casting female actors in roles clearly written for men — like the tough-minded rudeboy Hype (La-Toya Moulton), the Rastafarian juvenile pacifist Ni-Ah (Chantal Dormer), Alya Lewis as the fashion-loving Eliot Black Jr. and Paula-Gaye Donaldson as Reno, whose disapproving dad insists he evolve into a more macho specimen, military style. LEADING LADIES: We've long made no secret of the fact that we're huge admirers of Deon Silvera, the livewire actress who never fails to surprise, frequently lighting up the stage with her vivacity (Jamaica 2 Rahtid), sense of humour (Judgement) and expert comic timing (Back A Yaad). This December we expect her to deliver much of the same when she reteams with bonafide theatre sister Dahlia Harris, alongside living legend Volier 'Maffie' Johnson, for Ole Firestick, a three-hander of a romantic comedy to be mounted inside a Kingston venue to be announced in short order. The show will mark Silvera's umpteenth collabo with Harris, whom we are happy to report, is fully focussed on helping to usher Jamaican theatre into a bold new chapter. With her immense clout and the ever-widening ambition of her DMH Productions, there's much to look forward to. HERE COMES TROUBLE: Easily one of the most avidly anticipated shows of the imminent holiday season, Bashment Granny 3 will have its big world premiere on Dec. 19 at the Green Gables Theatre, featuring a dizzyingly talented cast led by Keith 'Shebada' Ramsey, Terri Salmon, Garfield Reid and Junior Williams, among others. With showbiz mastermind Bunny Allen leading the charge, Stages and RBT Productions have already embarked on a major promo campaign aimed at attracting nightly sold-out audiences. It's been quite a few years since the original Bashment Granny (with Maxwell Grant in the lead) and its laugh-out-loud Part 2 etched their collective place in the consciousness of the theatre-going public. Folks have been clamouring for more ever since. It's not immediately clear what accounted for the long delay in rebooting the rootsy franchise, but we understand that a movie version was in the works, with plans for its debut in the local cinemas. It remains to be seen if that will come to light. For the time being, devoted fans of the Bashment Granny series remain intrigued to see what Shebada and his motley crew are up to this time around. THE BEST OF HIM: Local roots theatre aficionados have lost one of their favourite entertainers, with the sudden passing of cross-dressing actor Cleve 'Chu Chu' Warren, who died on Thursday at the St. Ann's Bay Hospital, where he was taken after complaining, reportedly, of feeling dizzy. He was 46. Here at TALLAWAH, we are indeed saddened by the news and offer our sincere condolences to his relatives and friends. A bonafide star of the stage, Chu Chu had natural comedic flair and understood the healing power of laughter, clearly relishing nothing more than to give the people what they want - often sending us rolling in the aisles with his side-splittingly funny punchlines. For all he brought to Jamaican theatre during his brief time with us, we want to say thank you, thank you. MIRACLE IN A BOTTLE: Munroe, with some of the products from the line, which made its public debut at the recent Jamaica Wellness and Beauty Expo. To hear Elizabeth Munroe recount the healing properties of "Inflam-Ease," one of the miracle workers among the newly launched Doctor Bird line of herbal formulas, is to be convinced it is the most effective remedy against ailments like the mighty chikungunya (Chik-V) virus. "It is an excellent formula for the joints and to boost immune power against the virus," the sales rep explains. "It comes with the guinea hen weed that is well-known to destroy the virus, as well as turmeric and basil and other natural anti-inflammatories." In a nutshell, the Doctor Bird line, made up of nearly 20 products, is perfect for detoxing and recharging the human body. And, as the brochure attests, that's exactly what the estimable Dr. Heinz-Peter Becker had in mind when he set about concocting the all-natural Jamaican formulas that eventually took shape as a line of "safe and effective botanical medicines formulated with attention to documented research on the medicinal use of organic and wildcrafted herbs." Among the batch of products, ideal for the health-conscious and holistic-minded, are Internal Formulas like the "Athletes Power Tonic," a secret of top Jamaican athletes to maximize energy and endurance and boost peak performance; the respiratory-aiding "Breathe Free"; and the mental acuity-improving "Forget-Me-Not." Rejuvenate and energize yourself with "New U Detox and Cleanse", bolster the nervous system with "Stress Ease" and experience sustained weight management with "Pounds Away." Want to enjoy deep and restful sleep that leaves you feeling refreshed by daylight? Then "Sweet Dreams" is right up your alley. Meanwhile, Doctor Bird's nearly ten Topical Formulas (AdZuki Facial Scrub and Wrinkle Free among them) promise to deliver the glowing skin of your youth or, as Dr. Becker so eloquently puts it, "facial rejuvenation." > To learn more about the Doctor Bird line, contact office@doctorheinzbecker.com or log on to www.doctorheinzbecker.com. SPREADING HER WINGS: "It's the experience; learning more than I did before, " says the actress, photographed inside the Dennis Scott Studio Theatre. "When I was growing up, acting was something I was always interested in, but I never thought I could actually do it," recalls Alicia Taylor, who mesmerized audiences with her recent bravura turn as the brutish Colonel Lestrade in the School of Drama's brilliant ampitheatre rendering of Derek Walcott's Dream on Monkey Mountain. Interestingly, a few years ago when the Merle Grove High alum was filling out the paperwork to begin studies at the Edna Manley College, the Music School was foremost on her mind. "Then I heard a voice say, Why not try out for Drama?" And so she did. Thankfully, she heeded her instincts and has embarked on an artistic journey that has her poised to be the next big thing. Though she's appeared in the college's small productions of God's Door and the critically acclaimed Desdemona, it is Monkey Mountain that has secured her proper notice and could end up launching her professional career once she completes final-year studies. Having landed the role of Lestrade, Taylor says she knocked herself out preparing to put on the performance of her life. "It was like stripping myself down to nothing to take on this mulatto, who is such a complex character," remembers the 26-year-old, utterly convincing in a role originally intended for a male. "It was a lot of sleepless nights and a lot of tears. And [director Trevor] Nairne just drilled me. But I'm happy with what I came up with." As the curtains come down on the School of Drama's 2014 season, Taylor is leaving the show with only fond memories and a firmer grasp of how writers like Derek Walcott achieve their vision. "I found [the play] a brilliant piece, and having gone through the whole process of doing the show, I have a better understanding of Walcott's idea of colonialism and mentally freeing the Black race, so to speak," she concedes. In person, the statuesque Taylor (who stands at six-three) is very girl-next-door, articulate and warm if a tad tomboyish, which makes it easy to see why Nairne cast her in the pivotal role of Lestrade. She counts Johnny Depp and Morgan Freeman among her acting idols and is looking forward to one day combining her passions for the stage and singing into a one-woman tour-de-force. "It's the experience; learning more than I did before," she tells TALLAWAH of the singular thrill of being an actress whose star is on the rise. "And when I go out there on the stage to perform and people later come up to me and say, I really got what you were doing out there, for me that's what makes it all worth it."